And, exhale. The group stages of World Cup 2018 have been nothing short of bananas, a rollercoaster so wild we don’t think we could ride it again (kidding). On this strange, soccerless day, let’s take some time to digest the 96 matches we just feasted on. Which players produced moments of magic, scenes that will be replayed in decades to come? Who rose to the occasion and delivered for their country? Here’s Howler’s best XI from the World Cup group stages. To spice things up, we’re only picking one player per nation. This World Cup has lacked a standout goalkeeper so far. Kasper Schmeichel has been quietly excellent for Denmark while Guillermo Ochoa has once again turned into Superman when pulling on the El Tri uniform, but we’ve opted for Iceland’s Hannes Halldórson. The part-time filmmaker’s heroics, including a penalty save against none other than Lionel Messi, earned his side a 1-1 draw against Argentina—surely one of the greatest results in Iceland’s history. Later, Halldórson produced a fingertip save against Christian Pavón that could well go down as the save of the tournament. The bad news: Iceland’s World Cup is over. The good news? Halldórson will have that much more time to work on his next movie. Maybe it’s the ’fro, but Marcelo consistently stands out in a star-studded Brazil team. And he’s the left back. With the majority of Brazil’s moves going down the left side, Marcelo is a key piece of the attacking puzzle. He gets forward like a left winger, springing the Seleçao’s attacks with 1.9 dribbles and 2.4 key passes per 90 minutes. Now suffering from a back injury supposedly caused by a Russian hotel mattress, the 30-year-old is a possible doubt for Brazil’s tasty round of 16 matchup with Mexico. Perhaps it’s time to upgrade rooms, Marcelo? It would be an understatement to say there have been a number of surprises at this World Cup: Germany tanking, Russia soaring, and the lack of a clearcut favorite. Among the biggest shocks has been England putting in some, well, very un-England performances. Playing at the heart of Gareth Southgate’s three-man defense, John Stones has been instrumental to the Three Lions’ success. The 24-year-old’s incisive line-breaking passes help his side build attacks from the back, making for a more attractive style of play than England’s usual kick-and-run approach. 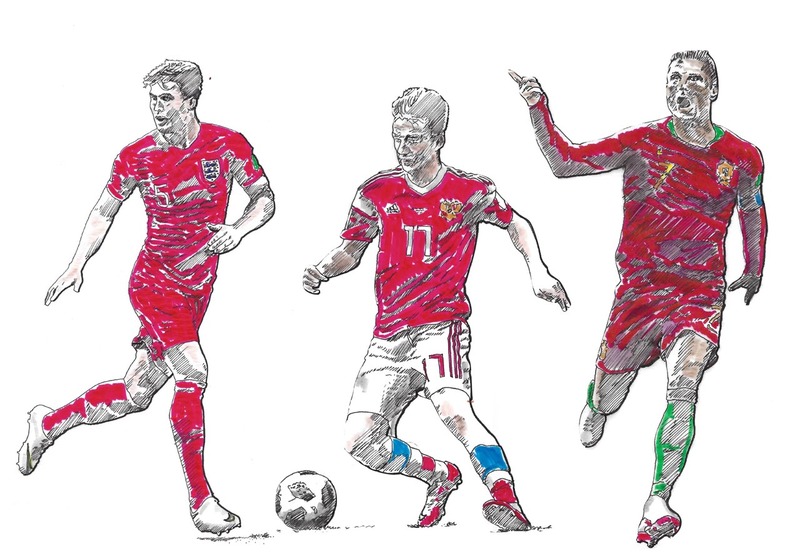 A handy brace against Panama, a 97.5% pass completion rate, and crisp defending throughout the group stages make Stones the World Cup’s best center back so far. It was stout defending and diligent organization that got Sweden to this World Cup (see their 1-0 playoff win against Italy), and the same recipe has taken them to the top of a tricky Group F against the odds. None of it would be possible without captain Andreas Granqvist. The 33-year-old has led a Swedish defense that conceded just two goals in 270 World Cup minutes, and one of them was that Toni Kroos wonderstrike. He’s also the side’s top scorer as it stands, converting crucial spot kicks with aplomb against South Korea and Mexico. They’re far from the most entertaining team to watch, but Granqvist’s dogged Sweden are not to be slept on. A country that virtually no one was talking about before the tournament, Iran nearly snuck into the knockout rounds (and boy was it close). That said, they did do enough to make it into our team. Portuguese coach Carlos Queiroz made the most of a squad without any star players, earning a draw against his homeland and narrowly losing to Spain via a pesky deflection. Right back Ramin Rezaeian was a vital cog in Queiroz’s well-oiled machine, holding his own against some of the biggest names in Europe. Oh, and he has a decent haircut, too. The host nation’s surprisingly superb performances so far (cough cough) wouldn’t be possible without Aleksandr Golovin. The 22-year-old makes Russia tick with his tidy midfield play, averaging three tackles and 2.5 key passes per game. It’s no coincidence that Golovin was on the bench for the Golden Eagles’ only off day, a 3-0 defeat to Uruguay. The CSKA Moscow youngster’s stock has skyrocketed, with the likes of Arsenal, Chelsea, and Juventus already circling for his signature. He’ll have to block out the noise for now, though, as Spain awaits in the knockout stages. With several of the tournament’s favorites faltering, Croatia have arguably been the most complete team so far. A balanced blend of Eastern European grit and attacking efficiency has seen them win all three of their group stage matches, including a 3-0 trouncing of Argentina. At the heart of this ruthless Croatia side is Luka Modrić, small in stature and demeanor but immense in influence. The Real Madrid maestro pulls the strings in midfield, dictating the tempo and breaking up play when needed. His sweet, sweet goal against Argentina gets better every time you watch it. With Modrić in the side, Croatia are capable of controlling—and winning—any game at this wild World Cup. Spain have more diminutive playmakers than they know what to do with: Andrés Iniesta, David Silva, Thiago Alcantara, the list goes on—but the pick of the bunch this World Cup has been Isco. The 26-year-old glides around the pitch effortlessly (or so it seems), ghosting past defenders with silky touches and moving the ball around ever-so-smoothly. As Iniesta sadly ages, Isco is taking the reins as Spain’s creator-in-chief. La Roja have only managed one win so far, but you get the feeling they’re still in third gear. Isco is the man to propel this classy Spanish side to play as mind-numbingly well as we know they can. Swedish humbling aside, Mexico have been one of the most thrilling teams to watch at the World Cup. El Tri counterattack with a venomous tenacity that’s impossible not to admire, as exemplified in their 1-0 win over Germany. On that day, it was Hirving Lozano who scored the goal that will live forever in Mexican fans’ hearts. The 22-year-old has been one of the breakout stars of the tournament, constantly taking on defenders and exploding into space with unbridled fire in his belly. In fact, he seems like exactly the type of player who will attract a reactionary move to a certain Spanish megaclub, á la 2014 James Rodriguez. Either way, we’re excited to see what the unpredictable Lozano does next. Perfect through the group stages and scoring a tournament-high nine goals, Belgium’s “Golden Generation” is finally looking the part. Eden Hazard, playing in a free role behind the striker, is taking over as the team’s talisman. We’re all for it, Eden. Several versions of Ronaldo over the years have been particularly fun to watch. Manchester United Ronaldo of 2007-08 was purely scintillating, dashing down the wings of England with unrestrained flair, while 2013-14 Ronaldo was utterly dominant, scoring a ridiculous 17 Champions League goals. At this tournament, it feels like we’re watching Ronaldo in his fully evolved form. While he’s not as involved or creative as he used to be, Ronaldo has become a scorer of pivotal goals, a trait that sporadically surfaced earlier in his career but is now an undeniable hallmark of his game. At 33 years of age, he became the oldest player to score a World Cup hat trick in Portugal’s epic 3-3 draw against Spain, and proceeded to score a game-winning diving header against Morocco in the next game. Portugal’s squad is far from the strongest at this World Cup, but the Cristiano Ronaldo effect knows no limits.